Aechmea pimenti-velosoi - Flower head of yellow flowers and red bracts borne on a short central spike. 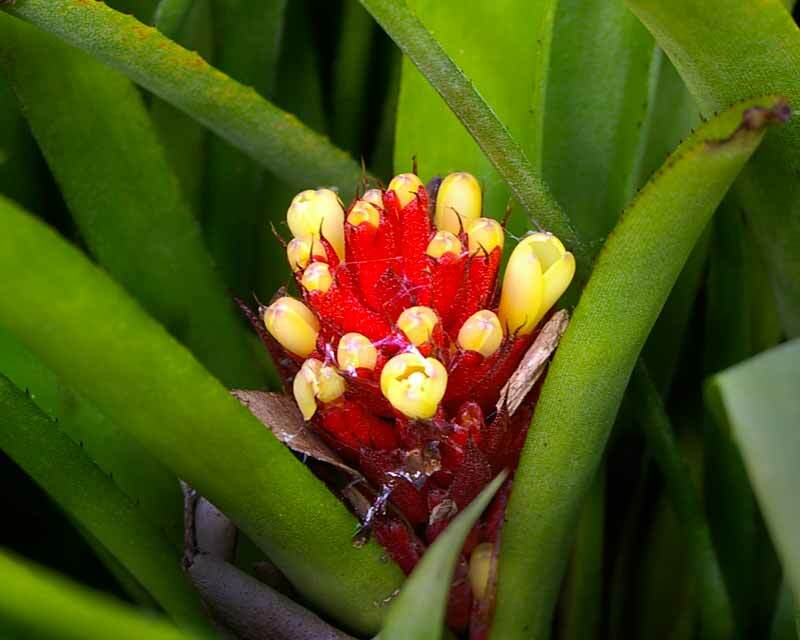 Aechmea pimenti-velosoi is an epiphytic perennial native to southern Brazil. These epiphytes do not take nutrients from the host tree but obtain most of their water and nutrients from the urn created by the rosette of leaves. This attractive plant has broad pale green arching leaves and a short spike of red bracts and yellow flowers that can last up to 6months. The strap-like leaves are leathery and have backward facing spines along the leaf margin. They are very sharp so take care when handling them, gloves are recommended. The leaves grow in a rosette formation creating a well in the centre that collects and stores water for the plant. When watering these always ensure that the well is filled with water as most of the water is absorbed through modified cells at the base of the leaves. Once the plant has flowered it will produce pups around the base of the plant. The pups will take nutrients from the dying parent plant and can be removed and replanted when they reach about a third of the parent. 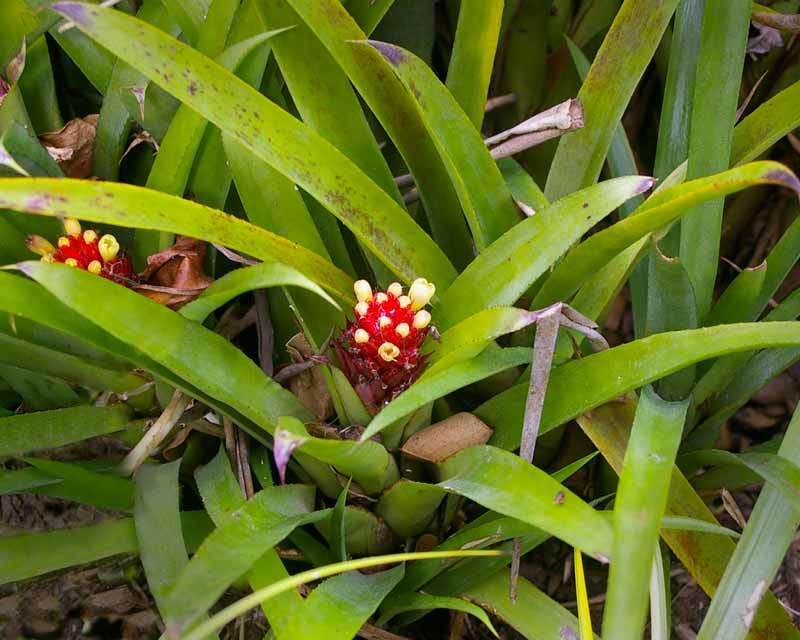 Aechmea pimenti-velosoi is a hardy species and it will grow in cooler climates, being able to survive a mild frost to about -2C. It also grows well in sunny and exposed sites. If you wish to grow them on a tree, place sphagnum moss around the roots before either wedging the plant in the fork of a tree branch or securing it to trunk using a semi-circular clip around the base of the young plant (Pup). Soil: Require well drained humus rich soil. When planting in soil make sure that you don't plant them too deep as this can cause the plant to die. Maintenance: It is important not to overwater these plants. As most of the moisture and nutrition the plant receives is from the base of the leaves in the leaf well it is important to make sure that this well is kept topped up. The soil around should also dry to damp, soil that is too moist will cause the plant to rot.